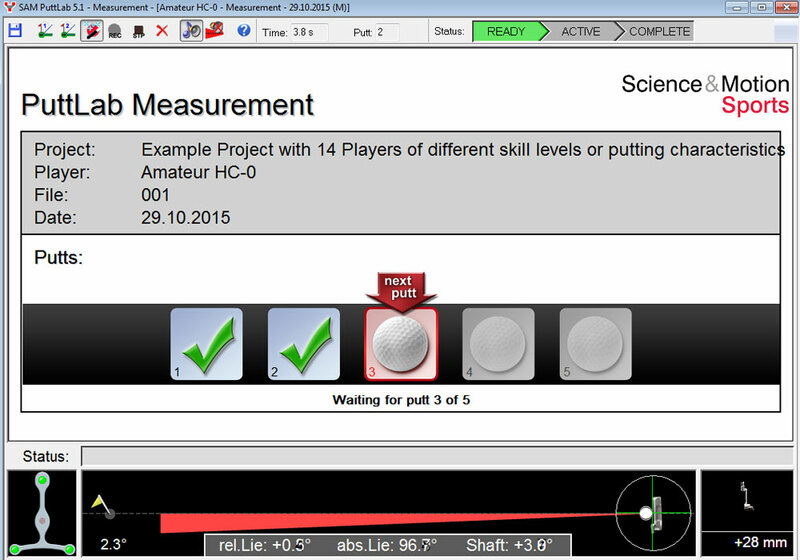 Download a free demo version of SAM PuttLab software! To get more info about the PuttLab software or how to upgrade older PuttLab systems send an Email to sales@scienceandmotion.com or use our contact-form. SAM 3D-Putt* is a brand new addon to the SAM PuttLab 5.1 software. See all putts in realistic 3D graphics and motion. To get more information please contact us by email to sales@scienceandmotion.com or use our contact-form. Apple, the Apple logo, iPhone™ and iPad™ are trademarks of Apple Inc.. App Store℠ is a service mark of Apple Inc.
PuttLab 5 allows users to remote control the PC software with the PuttLab App on smartphones or tablet computers. 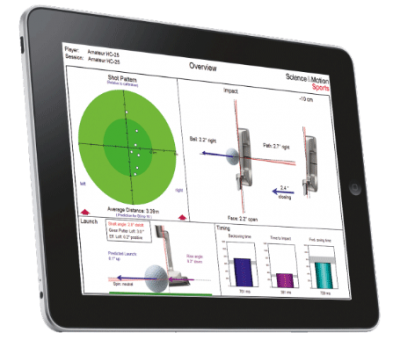 The iOS app offers direct remote control of the most important functions of SAM PuttLab: System calibration, starting measurements or training sessions, and opening the results reports. All data and the reports can be accessed through the App and can be stored locally on the device or on a cloud storage (Dropbox). The reports are available on the app as a picture gallery. Comments or media links (YouTube etc.) can be added to the reports and then sent to the client by Email. All available data can also be shared on Facebook and Twitter. 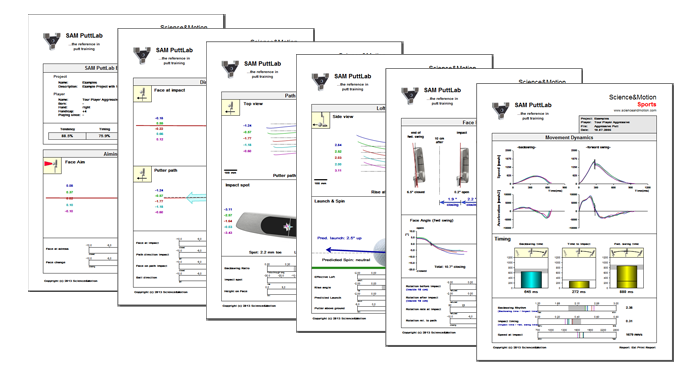 The results of the putting strokes registered with the SAM PuttLab are displayed in concise graphic reports. A variety of graphic reports are delivered with the system. Each of the 28 parameters measured can be included into the clearly presented data display. 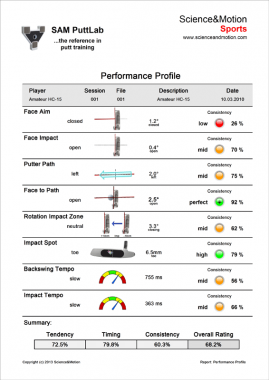 The new one page performance report presents a very easy to understand overview on the putting performance. It is a good report to be given to the student without confusing him with too much details of the data. The traffic lights signs on the right side correspond to the Consistency of a player and represent the repeatability of a putting stroke. The History Report displays the performance of a player over time in a line chart. The displayed data will be sorted due to the date of data recording. So a comparison of the performance values on different aspects of putting is possible. The results for each stroke are immediately displayed on the screen. This KR (knowledge of result) feedback has proven to be the most successful training method in learning skilled movements. The PRO training reports comprise 10 different report screens (check out reports gallery below). Switching between the different views is possible at any time.